The C128 Food Shield (sneeze guard) is stylish and practical. The all glass look with the crystal clear glass supports eliminates the visual barriers of metal post. This style has front shield at a 45° slope and a flat top shelf. The C128 is NSF certified sneeze guard has an overall height if 23-3/4 inches. A great feature of this self-serve food shield is that it can have up to 84 inches between supports. This means it can span most prep. tables, and drop-in units without center posts. The "Sculptured Support" is attached only at rear of the counter. This makes a multi-bay sneeze guard completely open on the customer side. No metal posts that the customer has to maneuver around. The "Deep Support" provides the 18 inches of closed access that NSF requires. The "Extended Support" is used when additional coverage is required. The C128 food shield has five standard supports styles made from 1/2" Clear or Crystal Clear safety glass. The "Sculptured" support is generally used as an interior support to allow the customer full counter access. The "Front" is used when the only attachement area is the front edge of the counter. The "Closed", "Deep", and "Extended" support are used as end support and shelf supports. Model C128 can be used for curved food shield. Sharp corners are possible with the C128. 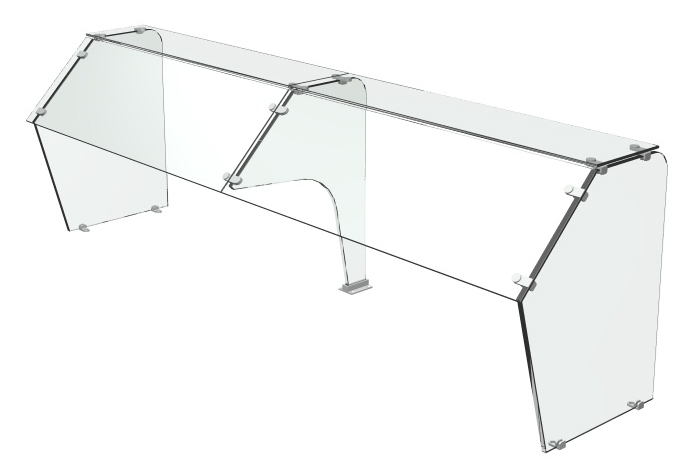 Custom safety tempered glass is manufactured to make a precise corner units.